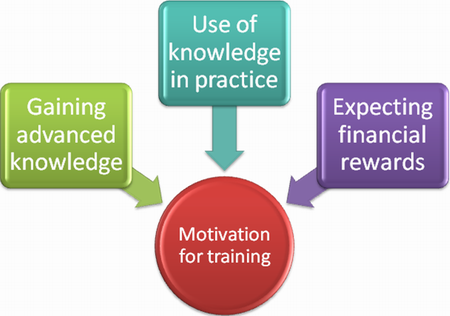 When we talk about Balanced Scorecard training or probably about any other training the most important question is the question of motivation. Even if you have the best material in the world, but people are not motivated to listen, your training will fail. 1) Company Owner. In the case of a large company, this might be your stockholders. 2) CEO. In a small company, the owner and the CEO might be the same person. In a large company, the CEO might be a committee of directors. For now, just focus on the concept of the CEO, regardless of the details of your company’s organizational chart. 3) Managers. In most of our trainings, we make a distinction between top managers, who work to improve the direction of the company, and line-level managers whooversee a particular business unit or business team. When it comes to motivation, however, we will simply use the term “Manager” to refer to an operational manager on any level of your organization. Of course, there are some managers whose jobs are focused on strategy, rather than operations. For the purposes of this training, you should think of strategic managers as part of the CEO category. 4) The final role is Line-Level Employees. These are the people who are supervised by your managers. Typically, they do not have subordinates of their own. They are actually working on the physical realization of your tasks. Learn more about motivating people during Balanced Scorecard implementation in the new eTraininig. Balanced scorecard has become popular in mid 1990s. Back then it became clear that nonmaterial assets of companies can even be even more valuable than material ones. Business is not just production facilities, real estate, investments, transport etc. So many companies tend to forget about company personnel. Ordinary employees make profits for the company. Very often top managers do not understand that as they are engaged in strategic games. When top managers came to understand this fact balanced scorecard gained tremendous popularity because this strategic management tool offered to evaluate also nonfinancial key performance indicators to measure company progress on the way to implementation of strategic goals. Just imagine such a situation. An employee has been working for the company for 10 years on the same position, having the same knowledge and skills. Rival company always organizes training sessions for its personnel. As a result competitors start to perform better. Consequently, they manage to optimize their internal business processes, cut expenses, offer products and services at competitive prices, attract new customers and retain existing ones and gain new market shares. Training is imperative in any business. Every commercial organization must expand and develop otherwise it will be wiped out by competitors. Development and improvements should start with personnel skills and knowledge. But training sessions should not become formality for the company. This is where balanced scorecard can help. Through development of key performance indicators in the four balanced scorecard categories it will be possible both to measure training efficiency and align training goals with the company strategy. Strategy maps will show clear cause and effect ties. For example, improvement of personnel knowledge will result in ability to use this knowledge in relations with customers which in its turn improves customer satisfaction, while customer satisfaction leads to sales growth which means growth of revenue. 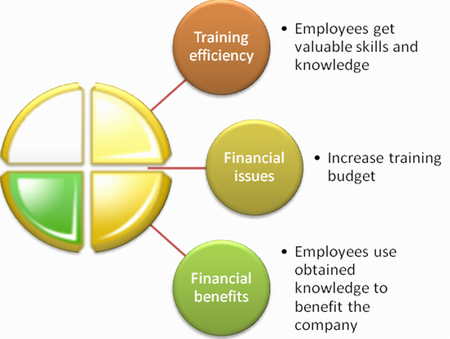 This hypothetical example shows how training can improve company performance. As said above, training goals should comply with requirements of the company strategy, its mission and core values. For example, a training session that improves employee computer skills may be absolutely unnecessary for salesmen, while the same training session would be quite beneficial for analysts and all those employees who process information. Development of correct strategy maps will make it possible to see cause and effect ties and directions for development. If necessary, goals and measures as well a strategy in general can be slightly amended to meet new requirements of external markets. Implementation of balanced scorecard requires a proper preparation. It does not matter on what level balanced scorecard will be used – for the entire company or an individual department – certain preparation needs to be done. It’s not enough just to talk about balanced scorecard. An extensive and broad discussion is needed. Moreover, much depends on discussion participants. Very often most companies start implementation of balanced scorecard with formation of working groups that will be in charge of implementation of balanced scorecard and its promotion in the company. 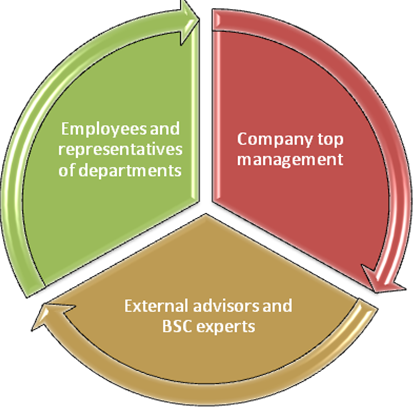 But there is a very typical mistake – such working group consists of top managers only or external advisors who have prior experience of BSC implementation in other companies. The problem is that such advisors possess important and valuable information in the field of strategic management but they may now very little about the company which is going to implement balanced scorecard. Something that is good for one company is dangerous for another. So, use of classical BSC models may even hurt the company. 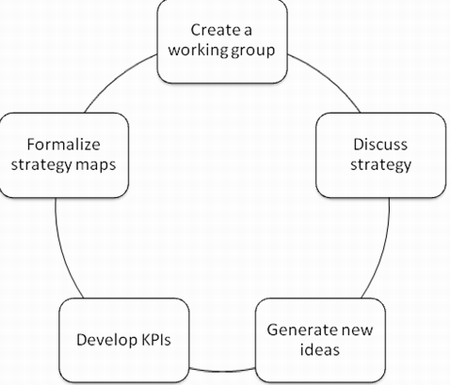 How to create an effective working group? When talking about evaluation of training efficiency it is vital important to include ordinary personnel to the working group and get personnel involved in the discussion. Employees need to understand why they should undergo training and what benefits they will have as a result of such training sessions. The most important issue is HOW to use acquired knowledge in practice. The training by itself is not earning money for the company, while educated employee may use new skills and knowledge to make profits for the company through attraction of new customers, offering products and services at competitive prices, using advanced marketing techniques etc. If company personnel will view work with balanced scorecard in evaluation of training efficiency just a formality the system will never work. Discussion of balanced scorecard should grow into development of action plan and strategy maps. Such maps will show the rooms and directions on how training will benefit the company and help that approach strategic goals. For example the company has the goal of gaining larger market share. This is possible through attraction of new customers, which in its turn is possible through offerings of new products and services and use of new methods of relations with customers. Obviously, employees need me you knowledge and skills. Strategy map should be easy to read otherwise ordinary personnel we just ignore them and they will stay just a top management feature. If company top management wants to make an effective use of the personnel it should make sure that all employees are properly motivated to work for the company. For example, if company management wants a particular employee to participate in a training session such an employee should know benefits of such education, otherwise he will simply come to a training session and leave it without learning any knowledge. Motivation concerns all activity aspects of personnel. When it comes to implementation of balanced scorecard, motivation of both top management and ordinary personnel is a number one concern. On the one hand, company top management should really believe in the power of balanced scorecard and show their faith to company personnel. On the other hand, ordinary employees at all company levels must be aware of both Balanced Scorecard benefits and their own contribution to the work of this system and implementation of company strategy goals, mission and values. Balanced scorecard implementation starts with development of strategic goals and drawling of strategy maps. Some companies are making a very serious mistake of imposing a strategy from the top to the bottom. If company strategic goals and key performance indicators are not understood for ordinary employees they are very unlikely to show enthusiasm. Thus, it is impossible to introduce any effective reward system. If an employee does not understand what he’s rewarded for it is impossible to talk about proper motivation. When it concerns education and training of personnel it is very important to select the right indicators to use them as a basis for reward system. For example, if employees get benefits for the number of training sessions they have attended, it will be just a waste of money for the company. But if the company pays an employee for the improved performance as a result of a training session this makes sense. It is extremely important that people who work for the company understand why they take part in educational programs. If they know how to use obtained knowledge to reach certain results within the framework of a strategy map such training session can be considered successful. At the same time such an employee will be motivated to participate in training since he gets bonuses and rewards for effective use of obtained knowledge. Finally, it needs mentioning that motivation systems can have both financial and nonfinancial nature. Money is not the only thing managers may use to motivate personnel. Development of strategic goals is not an easy task. In order to set correct strategic goals the company should possess complete information on its current conditions, weak points, strength, opportunities for development and growth etc. There are many performance evaluation and strategic management tools available and the market. SWOT analysis methodology is one of the most important and widely advertised. SWOT is acronym for strengths, weaknesses, opportunities and threats. Having performed such analysis the company becomes aware of what needs to be done to improve car and performance and implement strategic goals. AKS-LABS offers SWOT analysis guide which is designed for business owners, top managers and generally everyone who is interested in the problem of strategic management and SWOT analysis. This information package contains templates on SWOT analysis which can be used to create customized SWOT metrics for companies irrespective of their size. You’ll also find there frequently asked questions and implementation examples of SWOT analysis. It is also possible to track similarities and differences between the popular Balanced Scorecard and SWOT analysis which have been long considered competitors. The extensive SWOT analysis guide gives a comprehensive description of this methodology. 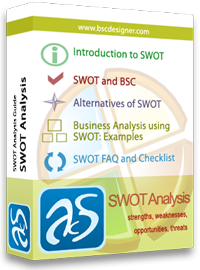 Get yourself a free version of SWOT analysis guide from his page or purchase the full version here. Different training and coaching sessions have become trendy nowadays. Companies either conduct own training sessions or send their employees to undergo coaching and training at special centers. But the problem is that very often company management and employees themselves do not understand benefits of such training. It’s not a secret that education of employees is rather expensive these days. Of why spend money for something that will not bring any benefits for the company? 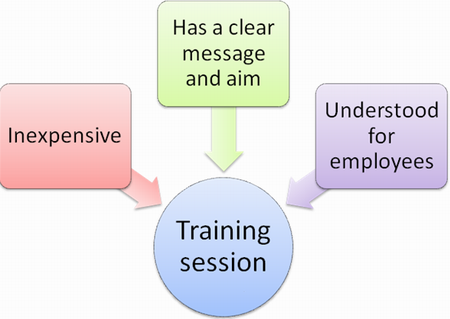 Of but as training is very popular not sending of employees to training sessions is considered to be a bad tone. Well, this is not to say that training is not necessarily. Just to the contrary, and effective training session will make it possible for an employee to use obtained knowledge and skills in real business. But how can you say whether or not a training session is effective? Will training cost become a major criterion? Or does employees satisfaction with training matter most of all? Consider using balanced scorecard and you will have answers to most of questions related to efficiency of training sessions. Balanced scorecard will not only evaluate training efficiency but will also align training goals and measures with the company strategy. In such a way, both top management and employees that undergo training sessions will understand why they do that and what benefits of training are. 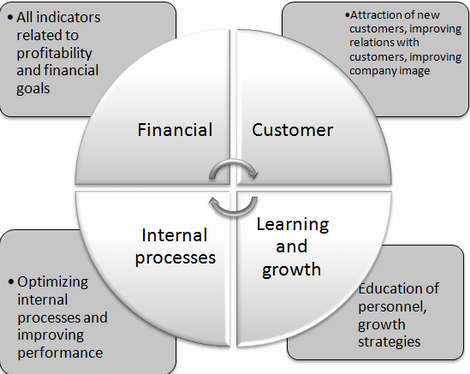 With a balanced scorecard it will be possible to see a clear cause and effect ties between training and implementation of strategic goals in each of the four categories of balanced scorecard: financial, customer, learning and growth, internal business processes. For example, to implement some financial goals, like increasing net profit, it is necessary to gain new market share and attract new customers which is only possible through introduction of innovative products and services, which in its turn, is possible through education of personnel and their ability to use acquired knowledge in practice. Much depends on the right choice of key performance indicators (KPIs). It is also important to set the right weight for each indicator in category of indicators. For some companies, it is impossible to increased training budget which, however, does not mean that their training sessions will be ineffective. Of other companies, to the contrary, need additional funds to invest in training in human resource management to improve professional level of the personnel. Use of balanced scorecard to evaluate training efficiency and is the right choice for any company. What are most critical success factors for any business? Efficient organization structure, investments, innovation, establishment of long lasting relations with customers, employment of competent personnel, innovative products and services, aggressive marketing campaigns etc. But the problem is that it will not work unless the personnel is regularly trained and educated. Business world is changing rapidly, and so are IT and production technologies, as well as marketing and promotion techniques, sales methods etc. If the company stops and its development, it is doomed to fail as it will have no chances to beat competitors. For this reason training of personnel is extremely important, no matter in what business area the company is operating. As any business aspect and development direction, training must be properly evaluated. Moreover, training goals and measures should be well integrated into the system of company strategy, values and mission. Every training session must have clear aims and objectives and these objectives should approach and the company to implementation of strategic goals. Any training session should have a clear message that is well understood for all participants. Of course, companies conducting training sessions want to have return of such kind of investment. As known, investments in personnel are the most effective long-term investment tools. With the help of balanced scorecard it will be possible to align training goals and measures with strategic goals of the company. What makes an effective training session? For example, the company wants to increase its market share by 10%. This is only possible through introduction of innovative products and adoption of new sales methods. In its turn, it can be achieved through improvement of personnel professional level. So, training sessions should focus on new sales techniques and methods as well as adoption of innovative ideas. In such a way, training results will directly influence implementation of objectives in all perspectives of balanced scorecard – financial, customer, internal processes, learning and growth. At the same time, it is extremely important to create winning key performance indicators to correctly evaluate training performance. The wrong KPIs will lead to wrong decision making which is not good. Such key performance indicators may include training budget, number of employees who have undergone training sessions, number of training sessions per employee, employee satisfaction with training session etc. The choice of key performance indicators depends on company strategic goals and organization structure. With the help of balanced scorecard it will be very easy to see what needs to be done to achieve strategic goals as cause and effect ties will be understood even for ordinary employees. Different trainings and coaching seminars have become so popular that many business owners never ask themselves a question: “What do we pay for?” A training session by itself does not guaranteeing a result. Moreover, every company has to pay for education of their employees. Of course, businesses face a choice: to hire experienced employees or two employed people with little experience and then educate them. At the same time, it should be mentioned that both experienced and inexperienced employees require education. Business is not idle. Production and IT technologies are constantly developing. That’s why personnel must not lag behind in order to stay competitive. 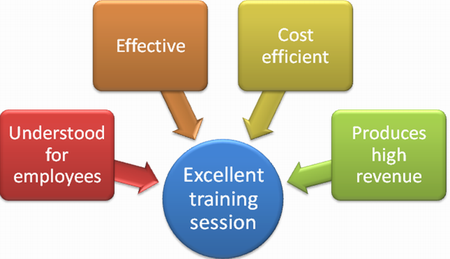 So, training evaluation gives characteristic of training and coaching sessions. Besides, with the help of balanced scorecard it is possible to measure company attention to training of personnel, changes in the training budget, track the number of employees who regulate undergo training and number of those who still requires additional education. Balanced scorecard will also provide top management with cause and effect ties, so that managers can actually see how training influences performance of employees and how this performance affects financial results of the company. 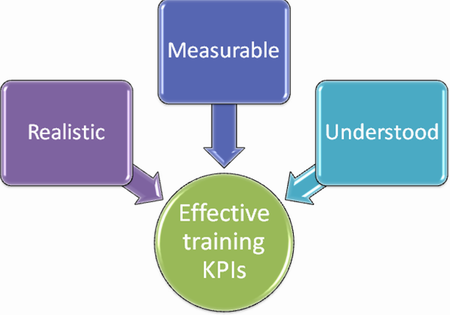 What are effective training KPIs? Training evaluation is expressed not only in financial terms. Of course, it is very important how much money the company spends to educate one employee and how much the company expects to get as a result of such training. But what is more important is employee attitude to training, willingness to participate in training sessions, employee initiatives as to changes and amendments in training programs etc. Evaluation of training requires top managers and those in charge of BSC implementation to carefully choose relevant KPIs. For example, total number of training hours per employee or number of employees who have undergone training may not be indicative. Effectiveness of training must be measured with a complex and well balanced set of key performance indicators. Training scorecard must reflect cause and effect ties between training and employee performance. Top managers need to remember that ineffective or untimely training is just a waste of money which is absolutely unacceptable in modern post crisis world of business. Effective training will not only educate personnel but also improve their motivation, and BSC is a great help here. Being aware of training benefits, employees will be glad to use obtained knowledge in practice in order to benefit the company and get personal bonuses. The library of Balanced Scorecard articles includes recent updates on the BSC and training topic. 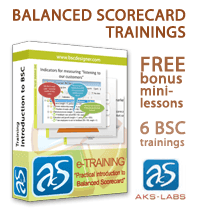 If you running your own training process and want to implement BSC inside, or you want to learn yourself how to design Balanced Scorecard, check the training section on the BSC articles web-site. Is There Really a Need for an Indicator for Privacy? What Kind of Indicator for Real Estate Should You Use? Goal setting is one of the most important stages of balanced scorecard implementation. To begin with it would be logical to say a couple words about balanced scorecard. This revolutionary system of strategic management was the first include nonfinancial indicators to the set of indicators to within a certain performance evaluation system. The problem is that financial indicators could not fully represent everything that happens to the company. Financial indicators are lagging indicators, or in other words they represent something that has already happened to the company. So, it’s very difficult to plan anything having only financial figures. During the past decades it has been agreed that human resource management plays an important role in the company. Any company should start improvements with improvement of personnel professional level. This is where training and coaching comes into play. However, of as any aspects of business and managerial process training should be properly evaluated. Moreover, all training campaigns and sessions should be subordinated to company strategic goals. Of ideally, any training aims at improving of customer satisfaction and improvement of financial results of the company. When a company spends money to train and educate employee, it naturally expects some results. Employee should use update knowledge and skills to show high performance which will benefit the company. When using balanced scorecard to evaluate training it is highly recommended to set realistic and clear strategic goals. Having said the wrong goals, it would be impossible to succeed in BSC implementation. Of the entire system will fail and the money spent for training will be wasted. At a first glance, goal setting in training seems quite simple. But such goals as “to conduct as many training sessions as possible” or “to increase employee participation in training sessions” will not do much for the company. Goals in training should directly correspond to the relevant financial goals. For example, a company may want to increase sales volumes by improving customer satisfaction and introduction of new products. To achieve this, personnel should be trained to promote new products in the market as well as learn the latest methods of working with new and existing customers. Only in such a way these goals will be meaningful. Moreover, training goals should be understood for ordinary employees as they will participate in training and spend their time. It is also very important that employees understand benefits of training sessions both for the company and for themselves.